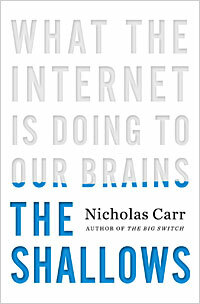 On a never ending flight from Lisbon back to San Francisco I finished reading the latest book from Nicholas Carr: "The Shallows - What the Internet is doing to our brains". The book is a very extended version of an article Carr wrote a few years ago enteitled "Is Google Making us stupid" that can be read online. If you like that article you will probably find the book interesting as well. In the book (and article) Carr tries to convince the reader that the internet is reducing our capacity to read deeply. He acknowledges that there is no turning back to a world without the internet and he does not offer any solutions, just the warning. He explains how the internet, as many other communication revolutions (printing press, radio, etc), changes how we perceive the world. In a very material way, it changes our brain as we interact with the web and learn to use it. He argues that the web promotes skimming the surface of every web page and that the constant distractions (email, social networks) are addictive. This addiction can even be explained by an ancient species need to constantly be on the look out for changes in our environment. So, by promoting this natural and addictive shallow intake of information, the internet is pushing aside the hard and deep type of reading that has been one of mankind's greatest achievements. After reading all of this I should be scared. I easily spend more than ten hours a day on these interwebs and my job as a researcher depends crucially on my capacity to read deeply other scientific works, reason about them, come up with hypothesis, experiments etc. So, why I am still writing this blog post instead of sitting in some corner reading some very large book ? Probably because I do not share Nicholas Carr's pessimist view. I actually agreed with a lot more things that I was expecting to before reading the book. I certainly believe that, like any other tool, the internet changes our brains as we used it. I agree also that reading online promotes this skimming behavior that the book describes. I observe the same from my own experience. What I find hard to believe is that the internet will result in the utter destruction of mankind as we know it (* unless saved by The Doctor). It is just a personal experience but, despite my addiction to the internet, I haven't stopped reading "deeply". Not only is it a job requirement, I enjoy it. One of my favorite ways to spend saturday mornings is to get something to read and have long breakfast outside. At work I skim through articles and feeds to find what I need and when I do I print to read deeply. That is why I have piles of articles on my desk. This just to say that I found a way around my personal difficulty with deep reading on the computer screen. In other words, if it is required, we will find a way to do it. The internet habits that might be less conducive to deep thought are not worse than many any other addiction of our society and we have learned to cope with those. I cannot imagine going back to a time when I would need to go to a library and painfully look for every single scientific article I wanted. Not to mention the impossibility of easily re-using other people's data and code. So even if a small but significant number of people can't find a way to cope with the lure of the snippets the advantages still overwhelmingly outnumber the disadvantages.